It was at the Thurber house where a ghost got in and a grandfather reliving the Civil War shot a police officer. 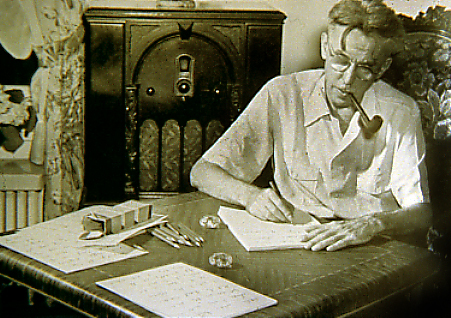 James Thurber was an American author and cartoonist. 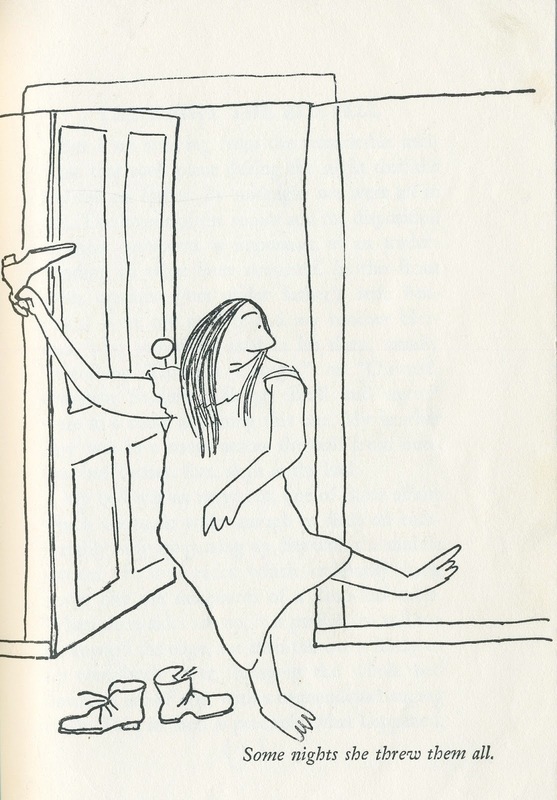 His writings were witty and his cartoons, which were often published in The New Yorker magazine reflected his genius. 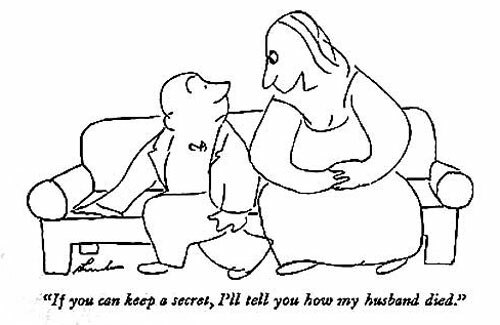 Thurber lost his sight in his left eye in a childhood accident and by 1952 he had to stop drawing because he went blind in his other eye--but he continued to write by dictating to a secretary. 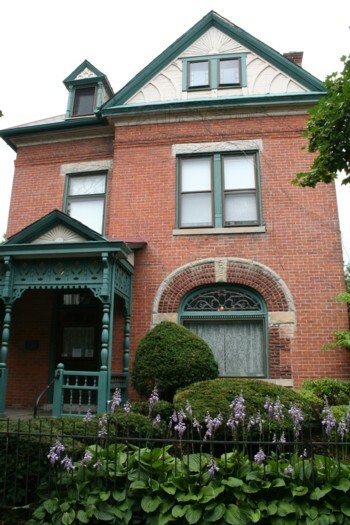 During his college years James or Jamie Thurber lived with his family in a home they rented in Columbus, Ohio. This home located at 77 Jefferson Avenue was built in the early 1870s. The land that it stood on was once a part of the Central Ohio Lunatic Asylum. 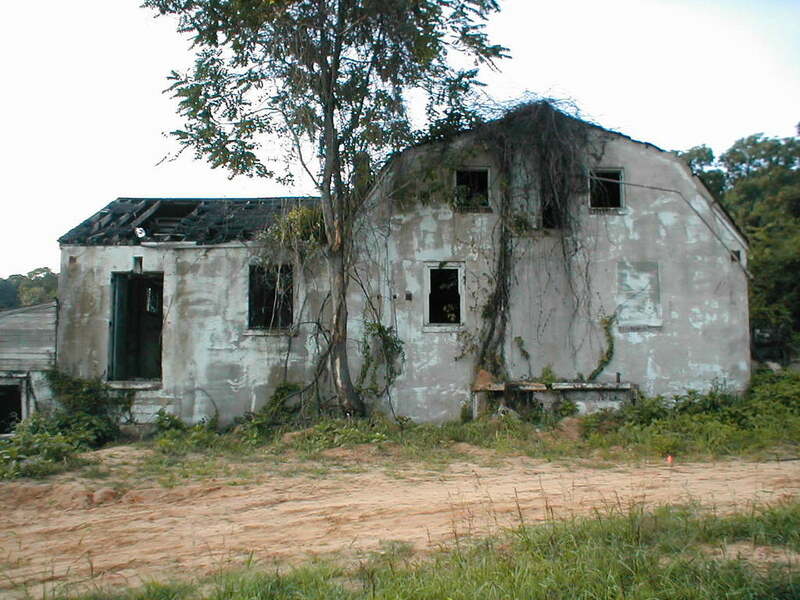 After the original building burnt down the land was divided into lots for homes. From 1913 to 1917 James,' “ large wacky family” lived in this neighborhood. Jamie’s family included: his father Charles and his mother Mary Agnes better known as Mame. James’ mother was a frustrated actress and comedienne who would launch into performances for whomever happened to be around. James had two brothers, William the oldest and Robert the youngest. His Grandfather Fisher--who claimed electricity dripped from every open socket in the house--also lived with the family. His bedroom was in the attic. The family also owned a plethora of dogs. James’ family was a rich source for many of the stories he wrote. Here is is one about a ghost, he, his mom and brother heard in this home. In November of 1915, Jamie’s father and older brother went to Indianapolis for the day. His mother and younger brother were both in bed sleeping as he took a bath. As he was drying off he heard footsteps in the dinning room downstairs. It sounded like someone was quickly circling the table. At first, Jamie thought his father and brother must have returned but the noise persisted and no one came upstairs. Jamie became concerned that it might be an intruder in the house. He awakened his younger brother and they both listened at the head of the stairs. For a while all was quiet but the running footsteps started again. The two brothers then heard them come partway up the stairs but when they saw no one they freaked out and slammed the door at the head of the stairs with a loud bang. This awoke their mother who came out demanding to know what was going on. Before the boys could explain the noises began again. She like the boys initially concluded there was a burglar in the house. Neither brother wanted to admit to her they thought it was a ghost. Mrs. Thurber exclaimed they must call the police. But the phone was out of reach--downstairs. Mrs. Thurber then rushed into her bedroom where she opened her bedroom window. Directly across was the neighbor’s window. Mrs. Thurber proceeded to throw shoes at this window until one crashed through the glass. She had quite a time calming Mr. Bodwell down-- since it was 2:00 a.m. in the morning--but she finally got his attention long enough to request he call the police. When several policemen arrived the family would not go downstairs to let them in so these officers smashed a beveled glass door and entered. As they rushed up the stairs Mrs. Thurber with a theatrical sweep announced to them there were at least 2 to 3 burglars in the home who had been banging on all the doors and windows. Skeptical, the police checked all the doors and windows, which were locked. They found no one. As they moved to leave however they heard a loud thud that came from the attic. Before the family could explain that was just Grandfather Fisher turning over in bed they rushed upstairs. As they charged into his room they woke him up. His latest hallucination was that General Meade’s men were deserting the rest of the Union troops on the frontline. The police immediately realized they had made a mistake but Grandfather Fisher didn’t recognize them. Thinking they were soldiers abandoning the cause he managed to grab one of the officers' guns and fired a shot at another. This bullet grazed the shoulder of this police officer. The cops then made a hasty retreat back downstairs. James Thurber stated afterwards he regretted that he had started the whole mess. The Thurber House is open to the public and they offer a variety of tours--including a ghost tour. A piano playing by itself, and a radio that changes stations at will. When the Dinning Room chairs are moved in order to vacuum staff often finds these chairs back in place. A broken clock on the downstairs landing is heard chiming four times. The home’s kitchen cabinets are heard rattling, especially at night. Apparitions have been seen in the attic. The shadow of a hefty man is seen crossing in front of the attic window and one visitor while looking in a mirror in this room saw a man wearing a bowler hat staring back at her. When she turned around he was not there. In another post the story of the British Spirit Photographer, William Hope is told here. William Mumler was an American Spirit Photographer. He was a jeweler in Boston and an amateur photographer. One day as he was developing a self-portrait he spotted the shadowy figure of a young girl floating behind his image. Mumler at first thought it was an accident, it was just a trace of an earlier negative made on the same plate. But he changed his mind when friends and family told him the young girl looked like his deceased cousin. This photo came to the attention of the American spiritualist community and was proclaimed the first photo ever taken of a spirit. Mumler didn’t disagree. Instead he became the world’s first spirit photographer. Expert photographers in Boston stated they believed these photos were not tampered with. Mumler’s new business became a success, in part because it was just after the Civil War and many people were seeking proof their deceased relatives still existed in some form. So Mumler’s was basically preying on their desperation. His British counterpart William Hope acquired photos by telling his clients he needed them to communicate with the dead during his séances. In contrast, Mumler would just break into people’s homes to obtain them. Later, his girlfriend, a medium, was able to acquire them for him. Mumler became wealthy and moved to New York to continue his business. The spiritualist community supported him wholeheartedly while his critics accused him of fraud. Once in New York it was discovered that several ghosts in Mumler’s photographs were actually people who were still living. In 1869, the New York police sent an undercover agent to investigate him. They then charged him with fraud. At his trial expert witnesses were brought in to testified that Mumler had created his photos with the use of double exposures. The notorious showman P.T. 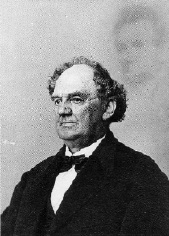 Barnum even testified against him. 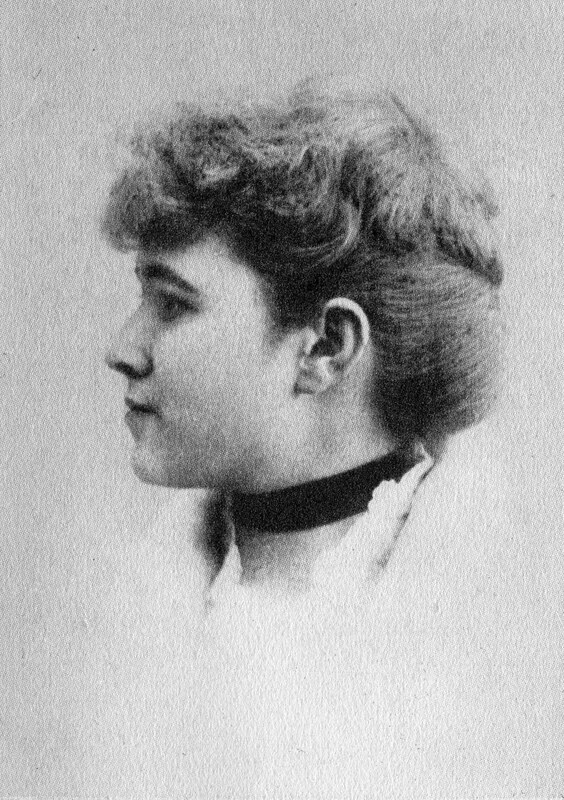 A photo taken of P.T. Barnum with the ghostly image of Abraham Lincoln floating in the background was introduced as evidence to show how easy it was to create fake photos. used as evidence in trial. Despite the condemning evidence presented, Mumler was acquitted. His defense team was able to bring in a large number of witnesses that stated the images in the photographs given to them by Mumler were real. Mumler moved back to Boston and continued producing spirit photos. But his business was no longer lucrative. 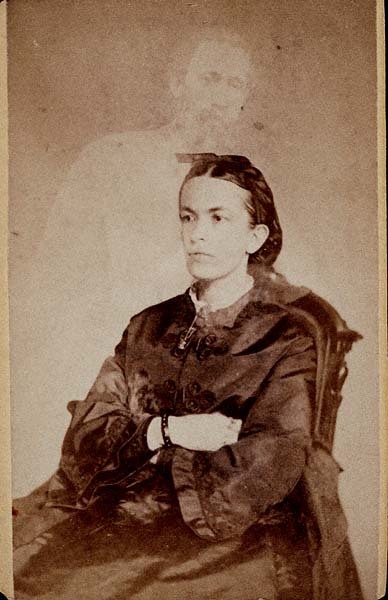 In 1871, a lady using the name “Mrs. Lindall” visited him. 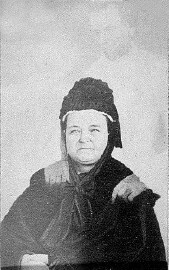 She was actually Mary Todd Lincoln and Mumler took the now famous photo of her with Abraham Lincoln floating over her left shoulder. Mumler stated afterwards that he had no idea that Mrs. Lindall was the former first lady and wife of Lincoln. Mumler’s faked photo is the last one taken of Mary Todd Lincoln before she died in 1882. Mumler wrote an autobiography in 1875 but his career was in ruins by this time. He stopped producing spirit photos in 1879 and according to most accounts he died penniless. 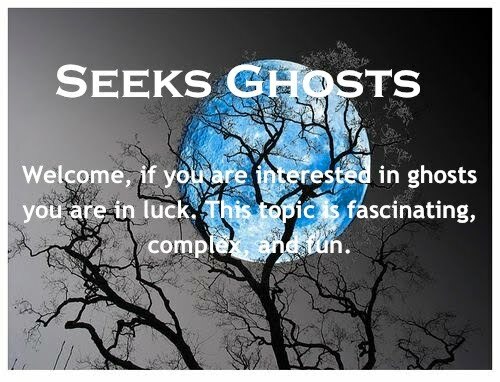 A young author by the name of Michael in search of a good story found an unusual ghost story while researching England’s mysterious Hellfire Clubs. 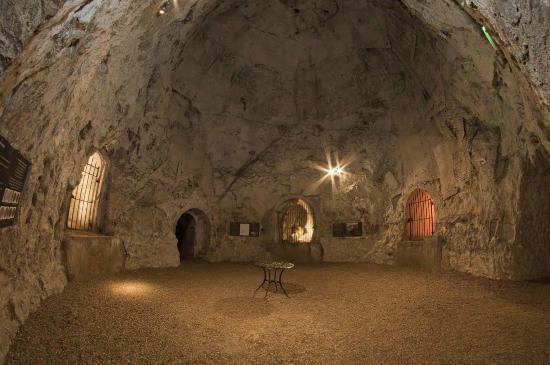 Hellfire Clubs were early gentleman’s clubs in England. The members’ names were kept secret along with what these clubs did. Both upper class men and women could join. 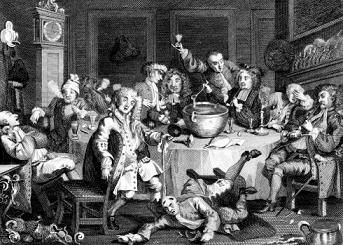 What is known is they started on the premise that the members were free--in other words they shred the traditional rules--and members could do as they pleased--including drinking all day and mocking the church. This also included sexual freedom. Rumors spread the members of these clubs were “devil-worshipers” * catching the attention of King George l who outlawed them in 1721. Despite this, more clubs formed. 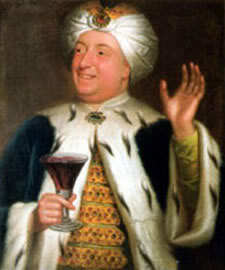 Sir Francis Dashwood started one of these clubs in 1751. His members called themselves the Monks of Medmenham--one member was Benjamin Franklin. By 1752 Dashwood’s group of “monks and nuns” were meeting in a series of caves he had fixed up outside of the small village of Wycombe. * In reality, the Hillfire clubs were not Satanists but they did follow the Pagan Mysteries. Michael discovering these caves were open to the public traveled to the small hamlet of West Wycombe. 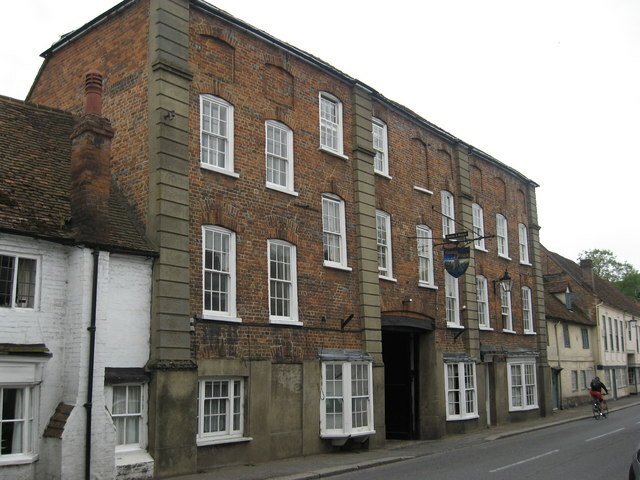 He made reservations at the historic George and Dragon Inn located between High Wycombe and Oxford in Buckinghamshire. He went to bed early wanting to be fresh for the next day’s excursion to the caves. Around 3:00 a.m. he awoke to a feeling he was being watched. There was enough moonlight streaming into the room that he had a clear view. He spotted a feminine figure sitting at the rooms’ small vanity. This girl, who appeared to be a teen, was staring into a mirror. Michael bolted upright when he realized she was watching him. She then turned around to face him. She was dressed in a simple white frock, cut in an old-fashioned style. A cloth was wrapped around her head. In the moonlight it appeared to be pink. Michael froze wondering how he was going to explain the presence of this female in his room. She then walked to the bed all the time staring at him and placed the back of her right hand against his cheek. Michael flinched for her hand was ice cold. Studying her face closely Michael noticed the girl was quite beautiful but her face seemed to be twisted in consternation. She looked at him seeming to plead for help. Still frozen in place he watched as she turned toward the window. She wistfully smiled and then slowly faded. The next morning Michael wondered if he had just dreamed the girl the night before. As he paid for a ticket at the caves he asked the attendant how long he could stay. This man told him that most did not stay long for several of the caves were small cramped spaces and many visitors became claustrophobic. He then told Michael others left quickly because of the ghosts. The caves according to him had three ghosts. The first was a man dressed as a monk, the second ghost had been identified as Paul Whitehouse a good friend of Sir Francis Dashwood and a member of his Hellfire Club. When he died Whitehouse had his heart put in an urn and had it placed in the cave. The urn, minus the heart was still there. The third ghost was of a young girl, a serving maid by the name of Suki who had worked at the George and Dragon. Michael realized it was her ghost he had seen the night before at the inn. Through his research Michael discovered that Suki had worked at the inn in the early part of the 18th century. A handsome nobleman, presumably a member of the Wycombe Hellfire Club had struck up a flirtation with her. Every time he passed through the village he would stop in to see Suki. Several local boys became jealous finding Suki was “putting on airs and acting above her station” so they decided to play a prank on the naïve maid. They wrote her a letter pretending to be her gentleman and in it they wrote he wanted to elope with her. Suki left work one evening feigning an illness. She put on her best dress and headed for the caves. She went inside with a lantern and waited for hours. But her lover did not appear instead she spotted three jeering faces. It was the three village youths who had played the trick on her. Realizing she had been duped Suki flew into a rage and yelled and argued with the boys. In the heat of the moment a rock was hurled and it hit Suki in the head. She fell unconscious and bleeding to the ground. The boys now afraid abandoned her. She was found dead the next morning. Before Michael left the inn he interviewed the proprietor. This man was amazed that Michael had not known that Suki haunted the inn. He told him that most people visited the George and Dragon in hopes of seeing her ghost. Suki’s ghost is seen in the inn’s upstairs bedrooms and on the staircase. She is seen wearing a bandage wrapped around her head soaked in blood. Michael realized that was why the scarf around her head looked pink. Suki is also seen walking out of one of the large supply closets in the kitchen. Her ghost is blamed for lost items and unexplainable cold spots felt around the inn. The story goes she is waiting for her lost love. Michael waited for her ghost to appear the second night he stayed at the George and Dragon but she never did. 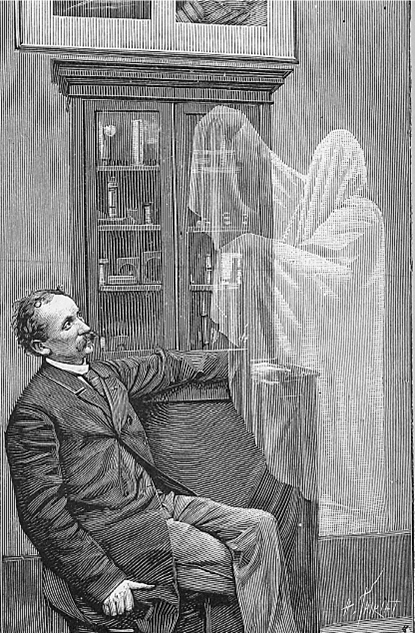 By the Victorian era, which started in 1837, ghost stories had fallen out of favor with the public in both America and England. Before the 1840s most ghost stories were passed down orally from one generation to the next but this was about to change. So why did this character have to complain about so many ghost stories? Many historians state the rise of the “periodical press” as the main reason. 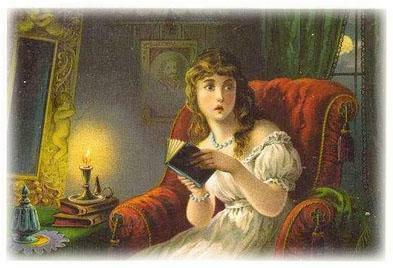 Before the Victorian era most ghost stories were not published in the written form. But with the rise of periodicals ** both in England and America the need arose for mass content. Ghost stories were a good match. Ghost stories were short, which made them easy to cut to the needed length. They were also plentiful and cheap. * In another post I talk about American periodicals--The Pulps--here. Writers such as Charles Dickens and MR James were already publishing their ghost stories at Christmas--Dickens even published a periodical called, All the Year Round, in which Wilkie Collins and Elizabeth Gaskell contributed stories. Now everyone could curl up by the fire at night and share spine-tingling ghost stories. They told of creaking floorboards, murmurs in the basement or even better yet fleeting shadows that might appear at ones elbow. Mysteries were presented along with these stories. Had the ghost been horribly burned in a fire or was the face seen on the wall a murderer condemned to walk the earth forever? In Britain and then in America slightly later, this renewed interest in ghost stories was fueled by several interesting factors. With the invention of the camera during this time--came an interest in “spirit photography.” This type of photography became the craze in part because of William Mumler--I share the story of another spirit photographer here. Yet another factor was related to economic changes. The Industrial Revolutions in both England and America caused mass migrations. People moved from rural setting into towns and cities. These cities--their noises and their foreign environments caused people to jump at every creak heard--their imaginations ran wild. The result was an interest or a belief in ghosts. A strong middle class formed with this migration--now more people could read and afford to buy cheap periodicals. It was during the 19th century that the Spiritualism movement took hold. It began when the Fox sisters in New York (1848) claimed they were talking to a male spirit through a series of taps. I tell more of their story here. The rise of Table Tilting and mediums and séances became a fad on both sides of the Atlantic after this. And most amazing of all was when the telegraph was invented-- and now people could talk to each other long distance--this fueled the belief in ghosts--for with every new scientific invention--people felt anything was possible. In the first part of this post the sad history of abuse suffered by the patients at this hospital located in Marlboro Township, New Jersey is shared. This abuse is why many people felt this hospital was haunted after it closed down in the late 1990s. Marlboro was torn down in 2013 and a park stands in its place today. 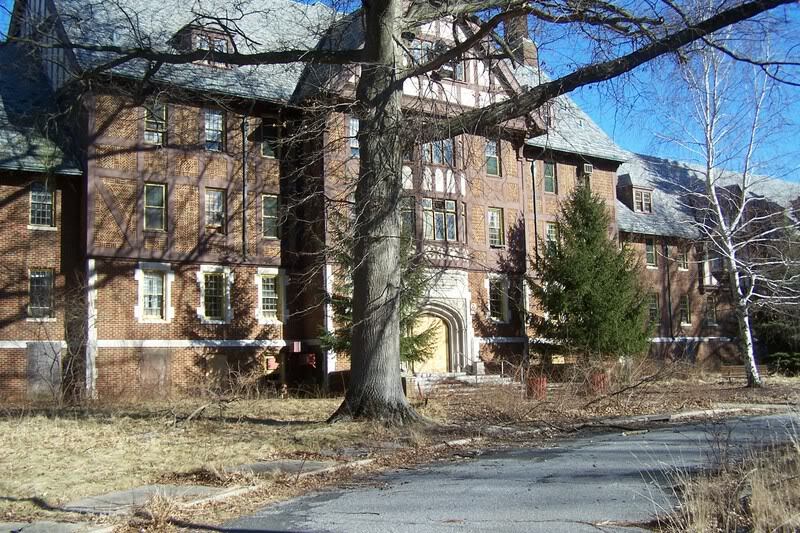 One popular legend told by Legend Trippers about this old psychiatric hospital involves the ghost of a demented farmer. The story goes . . .
A farmer named Allen owned the land that the hospital was built upon. His 500-acre farm had been in his family for generations. But the state wanted the rural property for their new hospital. Mr. Allen refused to sale but this didn’t matter to the government--they seized his property and kicked him off his land. This took Mr. Allen’s livelihood away, and having lost everything he owned it is said he went mad. Once the hospital was complete staff began to see Mr. Allen wandering the property late at night, muttering to himself. As time passed he became more irrational. When hospital staff tried to remove him he attacked. Ironically, after this he was committed to Marlboro as a patient. He stayed to himself and the hospital let him tend to the grass and plants on the grounds. One day he disappeared. A huge manhunt was organized but Mr. Allen was never found. A rumor later stated a vagrant passing through the state had killed him. Months after this, late at night strange animalistic squeals were heard near the old abandoned slaughterhouse on the hospital property. These squeals became louder and louder until they began to disturb the patients. Several becoming hysterical had to be sedated. He told his supervisor what he had found and then returned to his patrol. The next morning it was discovered this guard was missing. Several searchers entered the slaughterhouse. They opened the doors to a large metal freezer. Inside they saw the missing guard’s body hanging from a hook. He was covered in blood and his head was missing. In its place was a severed pigs’ head. The murderer was never found but later after several witnesses saw the ghost of Farmer Allen poking his head out of a hole in the slaughterhouse roof it was believed his ghost must have killed the guard. This slaughterhouse was torn down shortly after the rest of the hospital buildings were demolished. In Part l Marlboro Psychiatric Hospital, the story of the abuse that occurred at this hospital is told.